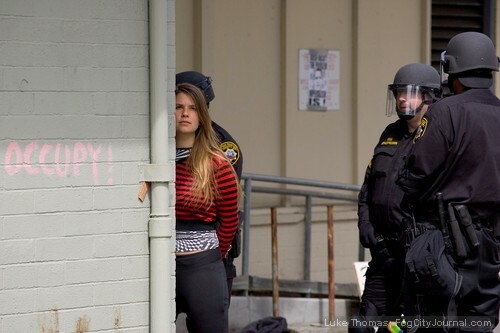 With a protest sign that read "Forgive us our trespasses" draped from a vacant building owned by the Catholic Church at 888 Turk Street, police, acting on a legally required authorization to evict, arrested as many as 80 OccupySF demonstrators Monday afternoon. The demonstrators occupied the former mental health clinic Sunday afternoon in an attempt to setup a community center and homeless shelter. Photos by Luke Thomas. 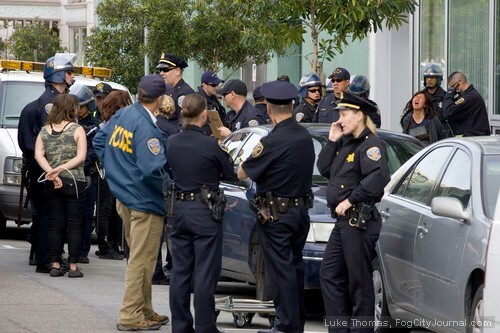 A day after Occupy SF took over a Catholic church-owned former mental health clinic with plans to set up a new headquarters, police – acting on a formal complaint lodged by the Archdiocese of San Francisco – arrested about 80 occupiers during a Monday afternoon raid. Police spokesman Sgt. Michael Andraychak said the arrests started around 1:15 p.m., with no force used or injuries on either side. 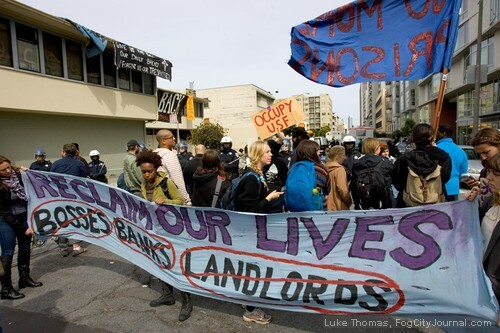 One protester, however, was believed to have suffered a broken wrist but it was unclear if the injury was sustained during the eviction. “They were in there illegally,”Andraychak said. He said police did not issue a dispersal warning beforehand, saying there were bricks and other objects police feared could be used to attack police. 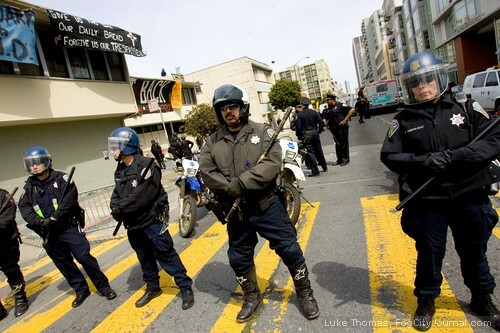 George Wesolek, spokesman for the Archdiocese of San Francisco, said occupation organizers were wrong in saying the building has been vacant for five years after the city cut funding for a mental health services center. Wesolek said the church bought the property five years ago and it held a center for a few years after. It was also used as music classrooms for Sacred Heart Cathedral Preparatory High until new facilities opened elsewhere. The building had been vacant for 18 months, he said. Wesolek said the church wants to lease the building, and pointed to numbers that more than a third of students from the school get financial assistance worth almost $3 million a year. “If we’re going to use this property for permanent income, we can’t have Occupy staying in it,” said Wesolek, noting graffiti, barricaded doors and damage to the building. He did not have an estimate of how much rent the building could generate. The church had said Sunday night that they would make a final decision in the morning, but Wesolek said there were no plans to meet with occupiers. Some in the building Sunday thought that was the case. 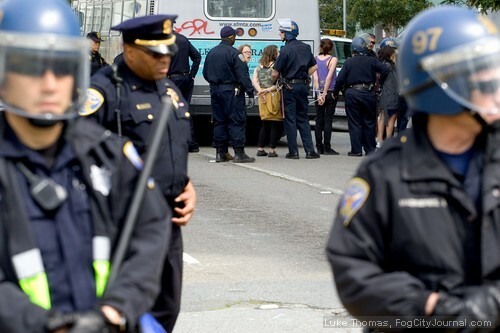 Jail Veda, a member of Occupy SF’s interfaith coalition, was still hopeful they can talk to the church about some temporary arrangement. He said the church has been sympathetic to causes like immigration and labor, and believes the church didn’t want them kicked out necessarily when they signed papers saying occupiers were not allowed in there. “They were always in solidarity with everything,” he said. Veda, who left Sunday night and was not arrested, said there was no plan to hurt police. He said those inside could not have been surprised by the daytime raid through the front door. The other doors were barricaded so those inside would feel safe from such raids, and the bricks were among the found materials inside used for the barriers, he said. 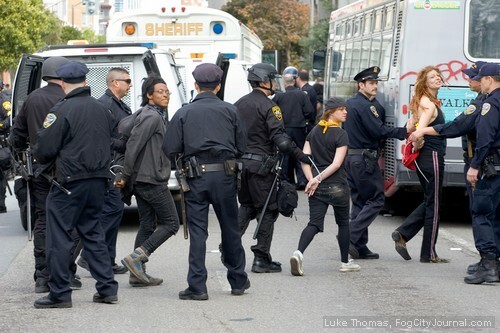 The occupation started Sunday after Occupy SF and other supporting groups held a rally at Union Square in conjunction with the Western Regional Advocacy Project’s “We Won’t Get Fooled Again” national action focusing on the criminalization of the poor and homeless. 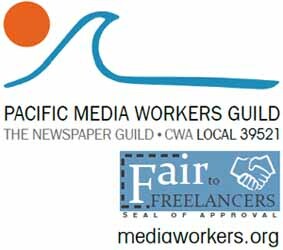 Eric Louie is covering the Occupy movements for The Newspaper Guild-Communication Workers of America Local 39521. 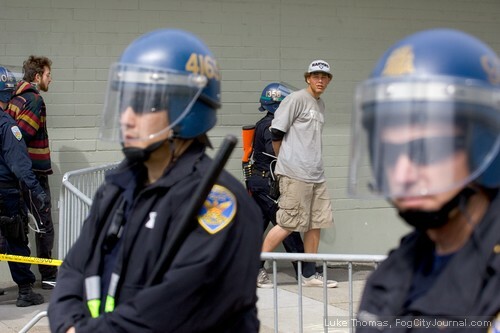 Comments for Catholic Church Authorizes Police Eviction of OccupySF are now closed. Exactly how does trashing church property help the poor? The Catholic Church is the richest non governmental organization in the world. There are more Catholics, who are rich and educated, than there are Chinese people–and it is one of if not the fastest growing religion in China. It closes down properties when it gets new facilities or is in the process of working out how they will be used. (My comment was aimed at Patricia’s comment). No, it’s not…but just cause you’re catholic, doesn’t mean you have an imagination. The two taboos of discussion in “polite company” are religion and politics. Many already know about politics. Seems like the time has come to think of the difference between having religion and being had by it, quite similar to government vs. governance. Too many use religion to justify their own violent tendencies….never G*D’s word. I guess the Catholics are concerned about insurance on the property. The Catholic Church is near broke after paying off victims of sexual assault by the priests. The Catholic Church talks about concern for the poor and homeless but their actions speak louder than their pious statements about caring for the needy. And this is their ‘holy week!’ Seems like arresting poor, homeless and hungry people is not what Jesus would do.